LiQsorb® Drops (Liposomal CoQ10) is a Bio-enhanced Liposomal Coenzyme Q10 formulated for enhanced absorption. 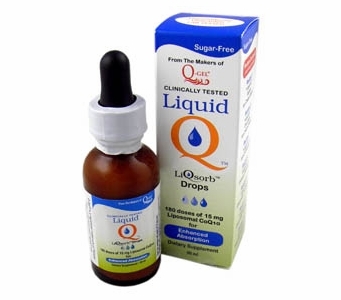 This new, (first available in October 2005), LiquidQ® from the makers of Q-Gel® Coenzyme Q10 is now available for mito patients and others in a 30ml bottle and delivers 15mg Liposomal CoQ10 per 6 drops. The 30ml bottle includes a dropper for easy, accurate dose measurement. Each 30ml bottle contains 180 doses of 15mg Liposomal CoQ10. There are 2,700 mg of Liposomal CoQ10 per 30ml bottle. This is a VERY powerful liposomal CoQ10 and is not flavored. To make it palatable, add 6 drops to (4 ounces minimum) of your favorite juice, smoothie or milk shake for a delicious treat supplying 15mg of hydrosoluble Co-Q-10. For 30mg of hydrosoluble Co-Q-10 add 12 drops. NOTE: The LiQsorb™ Drops Liposomal CoQ10 (30ml bottle). Directions: Add 6 (six) drops to your favorite juice, smoothie or milk shake. Q-Gel®, Li-Q-Sorb®, and LiquidQ® are registered trademarks of Tishcon Corp.